An unexpected development has occurred between the USA and China just as both powers seem destined for an inevitable confrontation of some kind. The USS aircraft carrier, Ronald Reagan, and her escorting task force (an Aegis cruiser and two destroyers) were granted permission by China to visit Hong Kong for replenishment and a port-of-call visit. The first link notes that this is an unusual development because China recently has refused to grant other US warships any permission to visit Hong Kong. One of the ships refused permission to visit was another US aircraft carrier, the John S. Stennis. The first link suggests that this was a case of “Beijing backing down” in the stare-down that has developed between the USA and China. That is possible, but I’m not entirely convinced that this is the case. However, in recognizing China’s gesture in allowing the US warships to visit Hong Kong, the USA reciprocated by flying the top general of the Chinese army in Hong Kong to be flown to the Ronald Reagan for a visit. There is an interesting sidebar to the carrier’s visit to Hong Kong. Since its arrival in port, there have been reports of cell-phones not working car-locking mechanisms malfunctioning, etc. 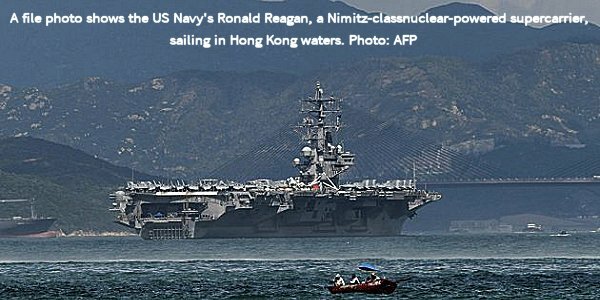 The second link describes the “electronic havoc” that some regions of Hong Kong have experienced since the Ronald Reagan arrived in port, and it opines that these may be caused by the carrier activating routine “anti-espionage” electronic countermeasures. Indeed, the electronic emissions may be heading both ways. While there are polite gestures being made in the open in this Hong Kong visit by a US carrier, I think it is a certainty that China and the USA are “sizing each other up” during this visit. China is undoubtedly engaging in, at the very least, passively monitoring every electronic emission from the four US warships and observing and recording all on-deck activities to discern anything new that they could use in a future war. I have no doubt that underwater Chinese cameras are taking pictures of the below-the-waterline hulls of the four US warships to analyze all sonar and electronic arrays of any kind to determine their latest purpose. Obviously, US naval personnel need to examine all replenishment supplies being on-boarded in Chinese Hong Kong for hidden listening or tracking devices and any other types of spycraft equipment. The US warships are surely monitoring all the electronic emissions of the Chinese monitoring efforts to determine what they can learn about China’s electronic abilities, frequencies used, etc. Also, since the USS Ronald Reagan is one of the largest warships in the world, there is a “wow” factor in allowing Chinese military personnel in Hong Kong to see how large and powerful it really is. The sight of a massive aircraft carrier bristling with high-tech warplanes must be an intimidating sight. The third link and fourth link raise the possibility that the carrier’s visit to Hong Kong may signal a thaw in the very tense relations between China and the USA. The third link observes that Chinese and American warships recently came within “45 yards” of colliding with each other and that two American B-52 bombers recently made a flight “in the vicinity of the [disputed] South China Sea.” Both links express a hope that this carrier visit signaled a warming of relations between China and the USA just days before the G-20 meeting in Argentina which is expected to include a one-on-one meeting between US President Donald Trump and Chinese President Xi Jinping. We can hope that this is the case even though both nations were recently firing ultimatums at each other in what looked to be an acceleration of tensions that could lead to a regional war in the Western Pacific region (see my post on this subject posted just a few days ago). It is also possible that the trade and tariff war between the USA and China is beginning to pinch both parties. Unquestionably, domestic blocs within both nations are pushing for a resolution of the trade and tariff war so normalized trade can resume. However, the pressure to reach such an agreement has greatly lessened on President Trump now that the US midterm election is over. Just days and weeks ago, China and the USA were so close to a confrontation that an itchy trigger-finger on the part of a warplane pilot or ship captain on either side could have started a regional war. This visit of the USS Ronald Reagan to Hong Kong is an important gesture in a part of the world where gestures sometimes speak louder than words. If this is a sign that both sides are stepping back from the brink, it should logically be followed by a break-through of some kind in the Trump-Xi meeting at the G-20 Conference in Argentina in a few days. If there is no such break-through, then the US carrier’s visit to China may just be an interlude in the growing tensions between the two great nations. From a biblical perspective, the end-game of this age has already been written by a heavenly power. The prophecy in Ezekiel 38-39 (and other related biblical prophecies) reveals that an age-ending global war will occur between the two great power blocs in the modern world. The Gog-Magog alliance which includes Russia, China and Iran and their allies will launch a surprise attack in some future year against the western alliance headed by the modern descendants of the ancient ten tribes of Israel (the USA, the UK, many NATO nations, Australia , New Zealand) and their allies (Japan, India, the Israelis, etc.). However, as I’ve stressed in previous posts, that prophecy describes the final battle between these two blocs and it does not rule out preliminary regional wars and conflicts between members of these two rival alliances in the latter days. For an in-depth examination of the members of these alliances and how this age-ending war will unfold, please read my free articles, What Ezekiel 38-39 Reveals about a Future World War III, The USA in Biblical Prophecy, Japan in Biblical Prophecy and Four Reasons the Jews are Judah. To examine the evidence about the Israelite roots of many of the western world’s nations, I invite you to obtain copies of either my four-book set or e-book on the topic at the homepage of my website.